For your special little flower girl, get a gift that she will never forget. Our Flower Girl Personalized Picture Frames are the perfect gift for your darling flower girl to will capture her special moment - when she makes her own walk down the aisle. Our Flower Girl Customized Picture Frames measure 8-3/4" x 6-3/4" and holds a 3" x 5" or 4" x 6" photo. Easel back allows for desk display. Engraved personalization features the natural wood grain color. Includes FREE Personalization! 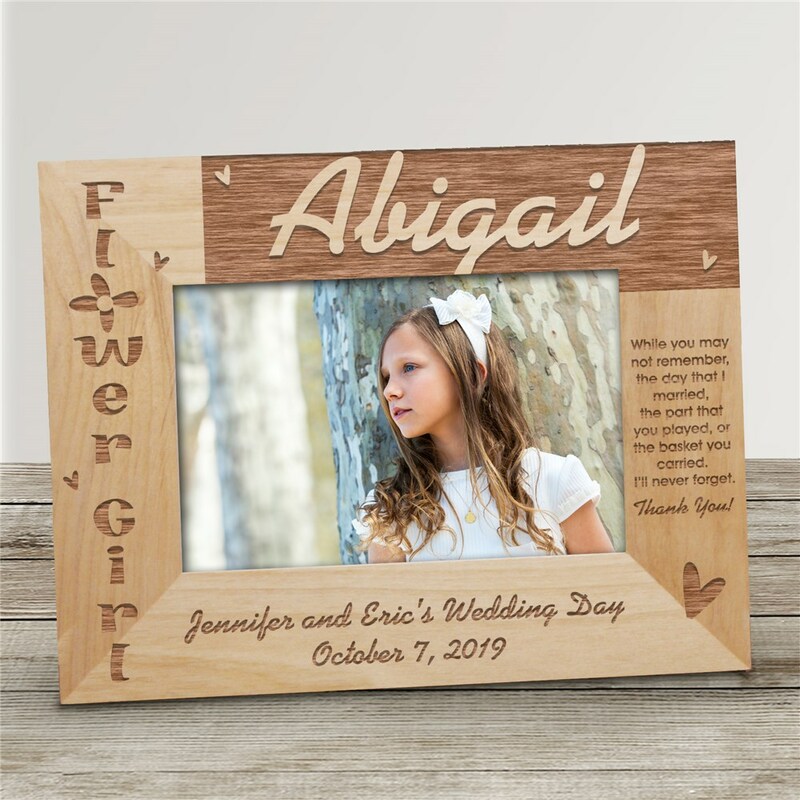 Personalize your Flower Girl Wood Picture Frame with any Flower Girl's Name, Bridal Couple's Name and Wedding Date. Please choose between two verses. Verse 1: While you may not remember, the day that I married, the part that you played, or the basket you carried. I'll never forget. Thank You! Verse 2: To our Special Little Flower Girl... We were lucky to have you. You made our day perfect! Thank You! Very nice, all real wood. Excited to give it to my flower girl. The wording on the side wasn’t completely centered but it still looks nice. Awesome item!! It will be perfect for my girls. Great quality and craftsmanship.